This library allows you to communicate with SPI devices, with the 86Duino as the master device. When a device’s Slave Select pin is low, it communicates with the master. When it’s high, it ignores the master. This allows you to have multiple SPI devices sharing the same MISO, MOSI, and SCK lines. The SPI standard is loose and each device implements it a little differently. This means you have to pay special attention to the device’s datasheet when writing your code. 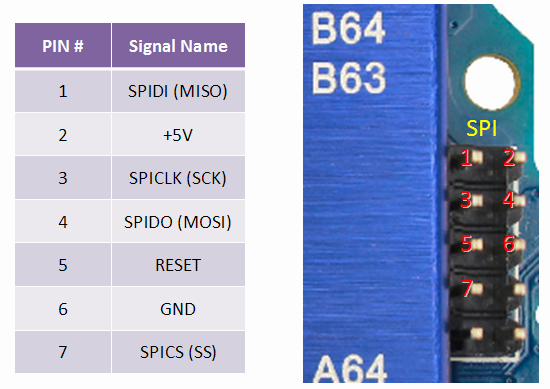 Every SPI device has a maximum allowed speed for SPI Bus. The SPI.setClockDivider() allows you to change the clock speed to make your device working properly. Once you have your SPI parameters set correctly you just need to figure which registers in your device control which functions, and you’re good to go. This will be explained in the data sheet for your device. For more on SPI, see Wikipedia’s page on SPI. 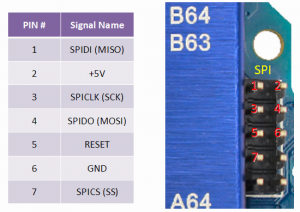 Note that MISO, MOSI, SCK, and SS are available in a consistent physical location on the SPI header; this is useful, for example, in designing a shield that works on every board.